A little over a fortnight ago we heard that the first 4K G-Sync HDR monitors were due within a fortnight. 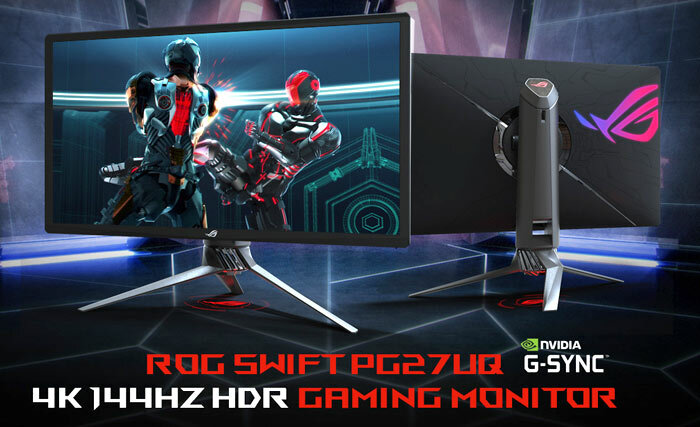 A few hours ago HEXUS received an email from Asus announcing that its ROG Swift PG27UQ G-Sync HDR Gaming Monitor would be available in June. An exact launch date and pricing are not available at this time. While we wait, let's have a look over all the specs of the forthcoming attraction. There are quite a number of highlights but starting with the basics this is a 27-inch 4K UHD (3840 x 2160) G-Sync HDR monitor. It is claimed to be the world's first gaming monitor with DisplayHDR 1000 certification, the highest VESA standard for HDR quality, for superior HDR visuals. As a reminder DisplayHDR 1000 equates to a 1000cd/m2 peak brightness. Of course, as per its name, this monitor supports Nvidia G-Sync technology for smooth tear-free gaming when paired with a modern Nvidia GPU. Astonishingly this 4K monitor can be overclocked to 144Hz for the slickest visuals in fast moving genres like racing and FPS titles (DP connection required for 60Hz+). Other gaming features include Asus GamePlus: which offers Crosshair, Timer, FPS Counter, Display Alignment features; and Asus GameVisual profiles: for FPS, RTS/RPG, Racing , sRGB, Cinema, Scenery modes. Asus factory calibrates these monitors with a delta E value of below 3.0 and boasts that the quantum-dot IPS panel offers up to 97 per cent DCI-P3 and 99 per cent Adobe RGB colour gamut. We are reminded that DCI-P3 has a 25 per cent-wider colour range than sRGB. Another point of note is that the panel supports local dimming over 384 zones for the deepest blacks. As with many modern Asus ROG products this device features Aura Sync lighting technology. The PG27UQ has an ambient lighting system which can be synchronised with other Aura peripherals and components. More conspicuous is the built-in ROG Light Signal which lets gamers cast the ROG logo onto the wall, and the Light Signature projection kit which projects a customisable logo onto the desk surface. For user comfort the Asus ROG Swift PG27UQ G-Sync HDR Gaming Monitor features flicker free, ambient auto brightness adjustment and low blue light settings. On the topic of ergonomics the PG27UQ comes with a stand offering swivel, tilt, and height adjustments. This ticks all the right boxes for me. Hopefully it'll come in at around £700, although I suspect the RGB lighting may add a hefty premium :P I'll be looking out for this. £700 laughs out loudly. A 1440p Gsync monitor costs that so 4K you're living on another planet. If it hits the UK expect to pay £2,000 or very close. Plus 4k on a 27“ monitor WTF. Who'd want to play on that? A 27” monitor is ideal for 1440p like my Acer XF270HU freesync monitor but 4K no thanks. If only it was 32" I would buy it despite the steep price.